As a star of several popular daytime dramas, Nancy Barrett has been the subject of dozens of magazine articles and photo spreads. 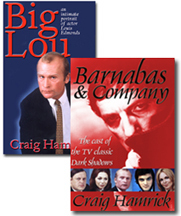 Following are excerpts from several of them. The February 1969 issue of Afternoon TV featured a one-page article titled "Nancy Barrett....From the Eyes of Her Fan Club Proxy," and included comments from her fan club president, Beverly Beck. Beverly reported that Nancy and her then-husband, David Ford (her Dark Shadows co-star), had spent the previous summer commuting to Virginia to do a play called "The Physicists." While there, Nancy was the Grand Marshal of the annual Fireman's Parade in Middletown. "She loves to travel," Beverly wrote. "She went to Ireland and England last summer and she's going to the Virgin Islands this spring... She's a very good cook, and she's a good singer.... She sings opera.... She loves to dance, except in crowded discotheques." The May 1969 issue of Afternoon TV featured a two-page article by Thomas Sexton, titled "Nancy With The Natural Face." The article traced Nancy's personal life: "Born October 5th in Shreveport, Louisiana....Nancy settled down in Midwest City (near Oklahoma City) when she was four; in her junior year of high school she moved to Bartlesville, Oklahoma.... Even as a child, Nancy and her sister Martha used to put on plays in their backyard. ("I'm not just saying that," Nancy said, "It's really true!") She attended Baylor University in Waco, Texas, for the first two years of her college life. There, she met Ivan Rider, then a drama professor (later a director in New York), who, she said, was the greatest influence on her early years. "He made me sing. He cast me in Babes in Arms, which meant singing Where Or When, and in rehearsal he used to say, 'You look terrified!' I kept saying 'I'm fine! That's the way I look normally!' but he wouldn't settle for that; he pushed and pushed until I finally broke into tears, and that was the best thing that could have happened to me. I finally realized that you can't just do whatever you feel like onstage." After her second year at Baylor, Nancy and two girlfriends spent a summer in Los Angeles. She starred in a production of Little Mary Sunshine, and fell in love with Los Angles. She transferred to UCLA, where she graduated a year later. She then played the lead in L.A., in The Fantasticks (with Bill Bixby, later the star of My Favorite Martian and The Incredible Hulk). From there, she moved to New York and more stage work. In 1966, she joined the cast of a new soap opera, Dark Shadows, in the role of Carolyn Stoddard. In the article, Nancy discussed the fan attention she found herself the center of as one of the stars of Dark Shadows: "I'm very bothered that some people talk to me as though I had no relationship to this world or any other," she said. "S ome people seem to think actors are strange beings -- either superhuman or subhuman. We're not. We're just people who've chosen this way of life because it's what we can do. If we could work in science or politics, that's probably what we'd be doing. I'm terribly pleased that people watch the show, and most of them are very nice...but so often I'm shopping in the basement of a department store or something and run into people who simply refuse to accept the fact that I'm a person too--shopping just like they are. Actors want to be recognized as human beings with lives of their own. We're not stick figures. We're flesh and blood and should be treated as such." Nancy discussed a negative fan mail letter she'd recently received from someone signing as "Miss Hateful." "I actually enjoyed that -- Grayson Hall got one from her, too -- because she was reacting against the character I was playing, and it had nothing to do with me whatsoever. Personally, as an actress I was delighted I had fooled her so well." "Carolyn isn't bad, but she isn't always good either," she explained. "As an actress, I try to make the reasons for what I'm doing very clear." 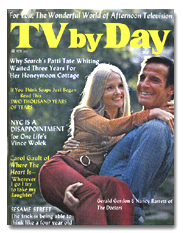 The cover of the February 1972 issue of TV by Day featured Nancy in the arms of her The Doctors co-star, Gerald Gordon. Inside was and article titled, "Miss Mississippi, Move Over...Here Comes Nancy Barrett," by Jay Edwards. The title was a reference to the fact publicty for Nancy's appearance in the play Star-Spangled Girl had overshadowed a beauty queen: "The people at the theatre were just marvelous and they did a fantastic job of letting people know about the production. I even outdid Miss Mississippi," she said with a giggle. "We opened up the Sunday paper one day and there I was in color on the front page; Miss Mississippi had to settle for a picture down in the corner." The June 1974 issue of Afternoon TV featured "Nancy Barrett: Paging Doctor Barrett" (no author was credited). Nancy had just joined the cast of One Life to Live, after spending a year on The Doctors after Dark Shadows was canceled. Nancy reported that while on hiatus from The Doctors, she had gone to Jackson, Mississippi, to appear in a Neal Simon play called Star Spangled Girl, directed by her former professor, Ivan Rider. "I loved doing a play again and I thought, 'Gee, what have I not been doing all these years?'" Nancy enrolled at Hunter College in Manhattan and took classes in biology and organic chemistry. 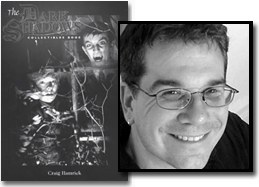 Her education was put on hold, however, when she got a phone call from Sam Hall, who had been one of the writers of Dark Shadows. Sam was now writing One Life to Live. "Despite the fact that I had the next six to seven years planned for myself, (Sam) asked 'Nancy, have you any interest in doing another soap?' I said, 'No, absolutely not!'" However, Sam convinced her the role he had in mind would only last a month, which fit into the winter break at Hunter College. The part ended up lasting longer -- a year and a half -- but Nancy didn't mind returning to acting. "I like school and I love the sciences, but I got very bogged down. I came out of the semester with fine grades, but it had been a great deal of work and effort, so I think I needed the change -- the security of going back to something that I felt I was fairly adept at. I was looking forward to the change of atmosphere." The November 1976 issue of TV By Day found Nancy appearing on Ryan's Hope. In an article titled "A Single Woman Can Have A Full And Happy Life," she told writer Rocco Bufano that she was not living alone. "I live with the man I have been with for four years. He's a doctor, a psychiatrist actually. I've been marred and divorced twice, but this relationship is very different. I suppose I wasn't aware before what work went into maintaining a relationship. Both men I was married to treated me wonderfully, so when I began not wanting to be with them anymore I became confused and left. I suppose I had a very romantic view of marriage. I expected it to always be lovely and when it wasn't I had no idea what to do about it." Nancy said that following her divorces, she went into therapy to discover herself. "I tried to figure out just what it was that I wanted to give to another person and what I wanted from them. I began to examine my motives. You know, was I marrying for security, and if I was, that was pretty silly since I've always been able to take care of myself. Finally I reached a point where I began to feel a sense of myself. I realized that whatever I did had to be for myself. I realized a single woman could have a full and happy life. It was then that I met (Harold). And that's why this relationship is different for me. I can work at it because I've chosen it. Even my work has been affected by the awareness of choice." Nancy said that after her stint on One Life to Live had ended, she went back to college again. However, this time, she was offered a part on Ryan's Hope (the role of Faith Coleridge). "Again, I chose to do the soap. But I might still get back to school eventually. I can do anything I want to, and that's a nice feeling." In the January 1977 issue of Daytime TV, (in "I'm in the Happiest Period of My Life," by Gloria Paternostro) Nancy again discussed her life with her fiance. "Harold makes me happy," she said. "Before I was involved in this relationship, I would tend not to trust someone and not let it all out and exhibit the way I felt about something. I feel so much better! I probably leave him in abject depression," she joked, "but I feel so much better!" Nancy described the other things that made her happy: "Laughter makes me happy--people laughing--there's something contagious about it. Work makes me happy--I love to work. Accomplishments make me happy. In any area, people who do things superbly well, as in the Olympics...it absolutely takes my breath away and brings me almost to tears. Perfection...people who do things right. Kim Stanley acting--that's perfection! Anyone who does anything brilliantly: dance...music...Isaac Stern playing the violin." She also discussed what made her sad: "A lot of things make me sad--most of it on the seven o'clock news. It really undoes me. Wuthering Heights does me in every time I see it--every time! All I have to do is hear that music! He (Laurance Olivier) was so gorgeous then!" She also reported that she was getting in touch with another emotion: anger. "I've started learning to get angry. Anger, for a long time, was something I couldn't express. I think I was afraid I would be punished for it. But it was giving me ulcers. Now, I'm not talking about some piddling little thing, you know. I don't have temper tantrums over small items--I have temper tantrums over big items!" When pressed to describe something she liked about herself, Nancy mentioned her sense of humor, which she felt she had inherited from her father. "I don't mean it so much in the sense that I can make people laugh--but I can look on a situation and see the humor in it. It's vital to getting through life. Otherwise, everything is far too serious and far too much to deal with." She said she had learned a great deal about herself in the previous few years, but that she still had room to grow. "I want to be able to learn to live with the fact that I am not perfect, that I do not have to be perfect, and that people who love me do not expect perfection."